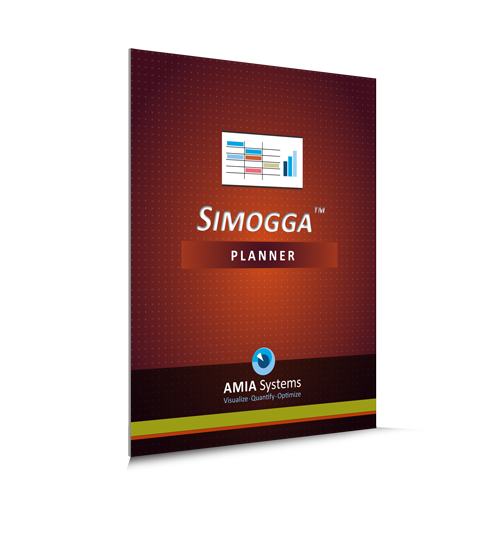 SIMOGGA Planner is used to simulate different scheduling scenarios: the user interface shows the impact of the congestion in the aisles and the level of the Work-In-Progress for the different periods. given limited resources (assets such as machines, buildings, vehicles, employees, time, budget) and respecting constraints (working hours, skills, affinities or logistic conflicts). The Planner is used to validate hypotheses as it allows to quantify and schedule alternatives. It takes the various product evolutions as well as the category of products into consideration and identifies bottlenecks for specific configurations while validating investments. Use the extracted data from the ERP or configure new data through the user interface. SIMOGGA may also be installed on other platforms not included in this list (such as other Mac OS or Windows distributions), but we cannot guarantee its full platform compatibility. SIMOGGA installation requires 300MB of free disk space. We recommend to have 4GB of memory and modern processor for optimal performance. Mouse is typically preferable to touchpad for graphical editing. If you want to have more information or to understand how to fully resolve a case with SIMOGGA; we recommend you to watch one of our video tutorials. In the showcased video, we explain how to configure the planner to fit your requirements and how to take advantage of the generated schedule to understand where your bottlenecks and how to improve the lead time of your production. We also demonstrate the numerous options available to analyze your production and to enhance the overall workflow of your plant. Multiple types of license are available (fixed, floating, renting by jeton or period). If you want more information about one of these options or if you are interested in taking advantage of our solutions, please do not hesitate to contact us either by e-mail or by phone. We will be please to talk with you on how we could help.